About a month ago they unearthed what might be the oldest ship in Toronto, possibly dating back to the 1830s. Now I don’t know about you, but despite my, shall we say, strong aversion to the ocean deep, the concept of steamship (and pre-steamship) seafaring life has an undeniable romantic appeal to me. It must come from some Hollywood conditioning or something, because I’m pretty sure seafaring life in most eras was pretty dismal. Super dangerous, terrible living conditions, Bermuda triangles, angry whales and suchness. Not to mention the sea was also a uniquely lawless wilderness of piracy, smuggling, and slave trading. All that being said, I can’t shake the image of holding onto a mast with the wind ripping past you while the shore fades behind you, soon only hearing the soft lap of waves against the ship and smelling the freshest of salty sea air. While Toronto today isn’t really of much international shipping significance, it has long been a hugely important place in the Great Lakes, and there have been lots of legendary ships that have graced its shores. Such was the Chicora. Built in the early 1860s in Liverpool, the Chicora was commissioned to be used by the Confederate forces during the American Civil War to try and bypass the Union blockade of the Carolinas. It* was originally called the Let Her Be to go along with another two ships called the Let Her Rip and Let Her Go (Yes, the 1800s are sometimes a cartoon). It left Liverpool in 1864 and made it to Bermuda in 8 days, which is speedy fast for ships those days. This sucker was built for speed (and, spoiler alert, longevity). It was apparently then renamed the Chicora before put into civil war action. 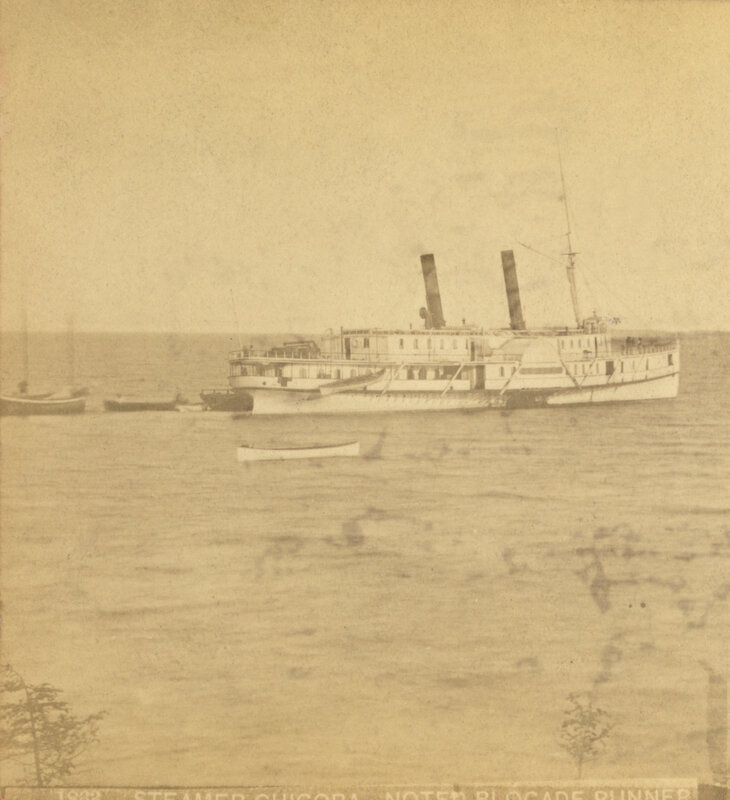 After being sold and almost entirely re-purposed as a passenger steamer, in 1869 it began a route along from Collingwood to Fort William, which is near where Thunder Bay is today. 1869 also happened to be the time when a dangerously powerful rebellion was gaining steam out at the Red River Colony. So the Chicora was enlisted again to transport troops and supplies from Collingwood as far as Fort William, and those troops would continue westward to try and quell Louis Riel’s uprisings. It got sold again in 1873 and was used in 1874 to ferry around the newly minted Governor General, Lord Dufferin (considering this was less than a decade after Canadian Confederation, this Governor General had some serious clout). See, don’t you want to sit up top and stare at the forest and the sky and stuff? It was launched in May 24, 1878 (which was a real-life Victoria Day), and soon kicked off its normal route, from Toronto down to Niagara. 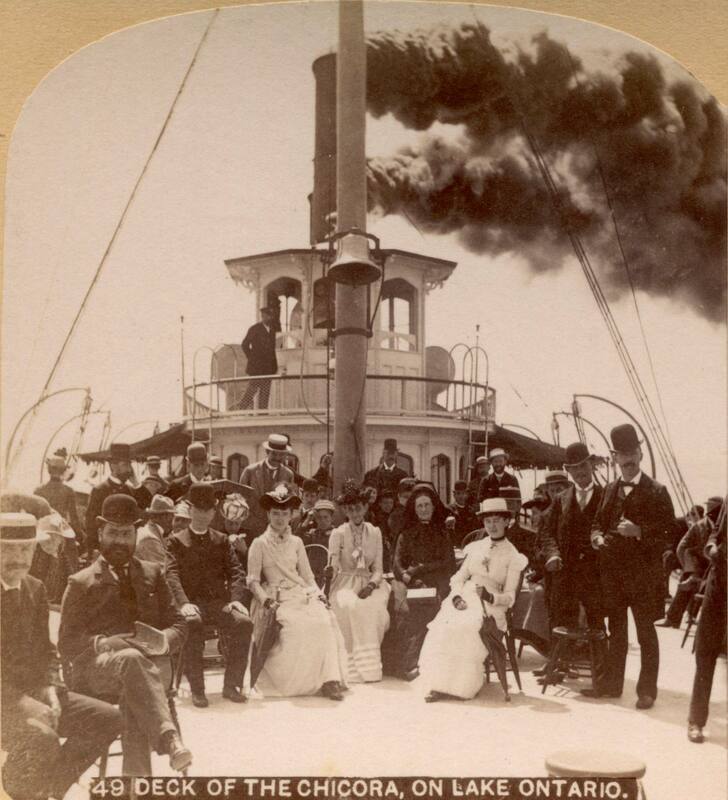 Within just a few years it became the top dog in lake Ontario and by far the most popular Niagara ship excursion. 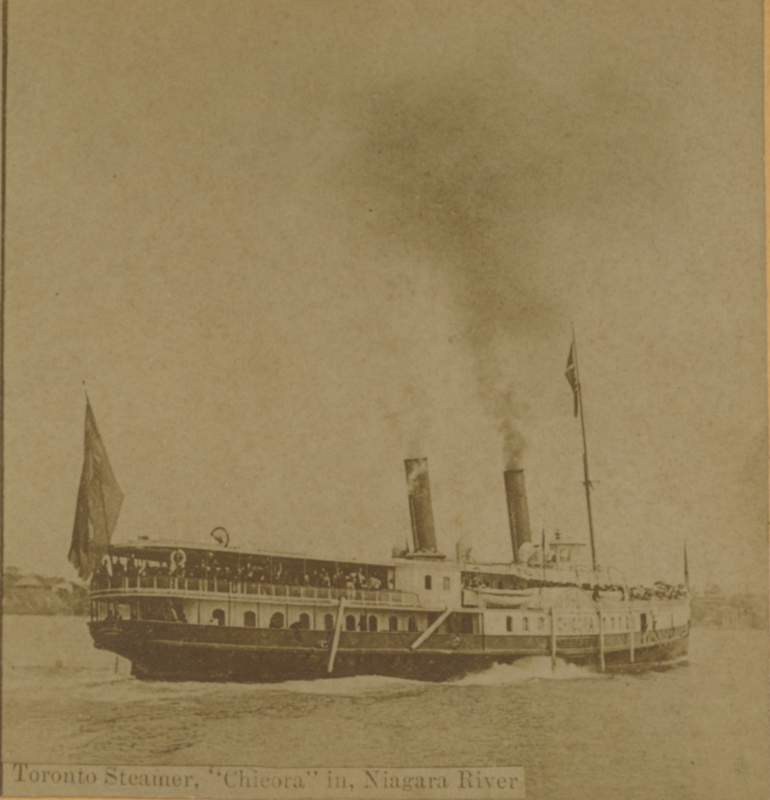 After about 15 years as the queen of aristocratic vacations, by 1893 The Niagara Navigation Company had built two other impressive ships to join the fleet and soon the Chicora was being outmatched. It was given another makeover in 1904, but it could no longer keep up with the younger, bigger ships. 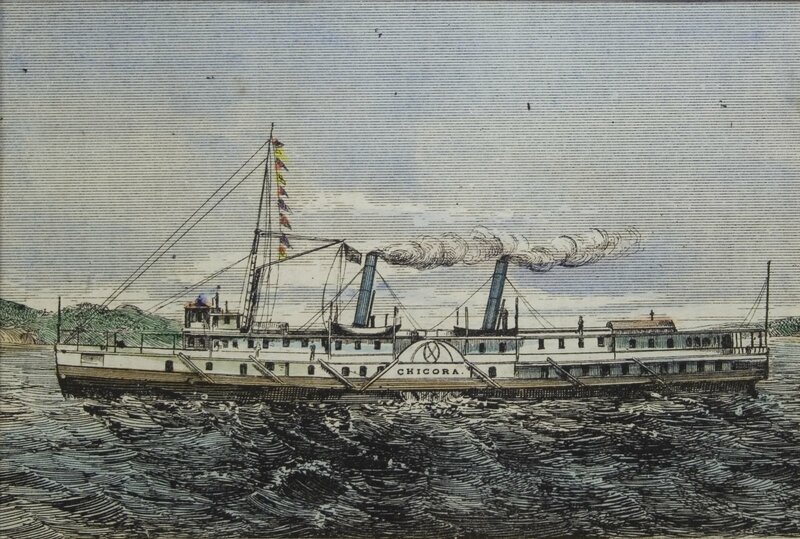 In 1895, still steaming away! Don’t deny it. This is EXACTLY who you pictured as the tourists who took part in the “burgeoning Niagara peninsula vacation scene”. Things really started to go downhill in 1913 when The Niagara Navigation Company merged with another company and in 1914 was but on a run from Toronto to some place called Olcott Beach, New York, which is currently only really home to this place. 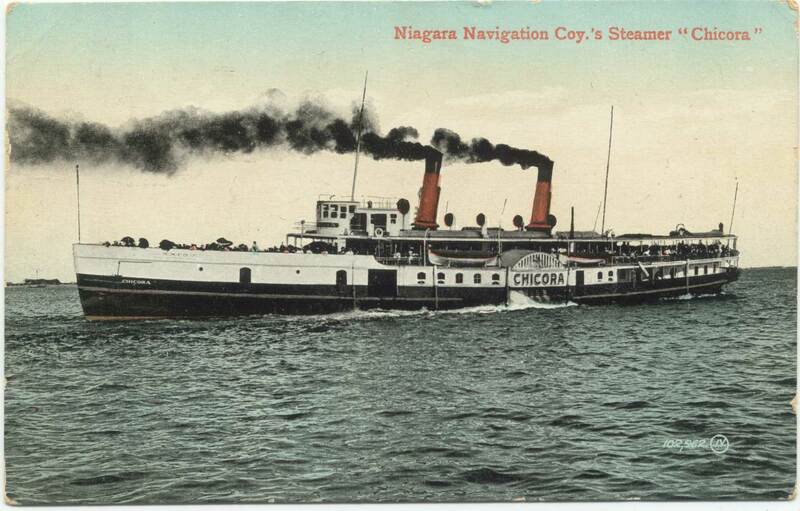 Clearly these were the twilight years, and on September 7th of 1914 the Chicora made its last passenger voyage. 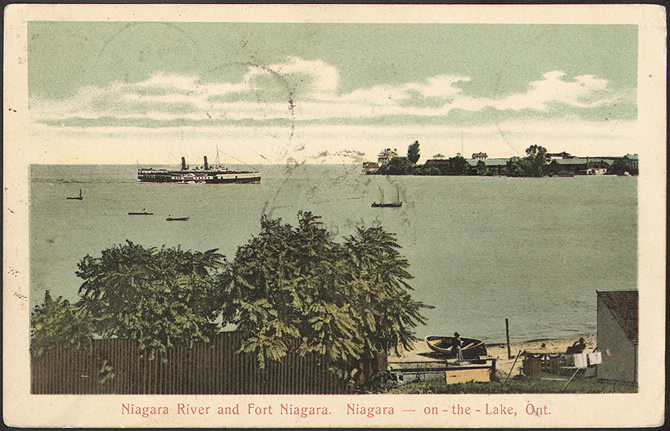 But consider that – For over 35 years this ship ferried fancy Torontonians to Niagara, in the prime of this ferry route (I would really love to try it out, actually – I bet if a ferry from Toronto to Niagara started back up, wine-tourists would flock down to harbourfront!). I think my favourite part of the Chicora’s whole saga is that it feels kind of like a personal story. Consider that when it left home to go overseas, it was a bit hotheaded and overconfident, and it got caught up in a some fighting and got hurt pretty bad. Then it moved on and tried to reinvent itself, but still fell back into some old habits. Then finally it got its act together and found where it really belonged, and had a long, respectable career doing some important, even if slightly frivolous work. Then it got kind of old and couldn’t keep up, so it retired in the Toronto harbour, eventually leaving the shores for good. 1907. I think it still looks pretty fly! After sitting dormant for a few more years, the Chicora was buffeted in a storm in 1919, and silently sank to the bottom of the harbour. It took them a while to resurface it (fun fact: they built the largest ever tarp manufactured in Toronto to lift it up, which was over 550 feet). Officially, the Chicora ceased to exist in 1920, although its hull was sold, renamed, and used as a cargo ship until 1938. *I suppose I should note that I’m aware ships are often referred to using the pronoun “she” rather than “it” but I just wanted to clarify that that has fairly recently become out-of-style. Literally. The Chicago Manual of style (and others) say you should use “it”. Plus, despite my fanciful musings, I’m anything but a legit nautical enthusiast or purist. **Perhaps I’m starting to understand how and why people personified ships.